A word as simple as “you” can change the dynamic of a conversation. Using “you” in a sentence such as “You never listen to me” or “You always wait until the last minute” insinuates the other person is at fault. Placing blame on another person is often used as an easy defense to avoid feeling your own pain or recognizing your own faults. When you begin to use tactics to blame your partner, things can start to go downhill pretty quickly. Playing the “blame game” in your relationship can cause both you and your partner to get defensive, angry, and mean rather than having a productive conversation. Conflict arises in even the healthiest of relationships, but reacting to conflict with blame can be damaging. Below are some ways to challenge the “blame game” in your relationship and, with practice, can aid in using adaptive communication in your relationship. While it may feel better in the moment to avoid the pain or discomfort you are feeling by tagging the blame onto your partner, it isn’t the best long-term solution. You may be missing an opportunity to reflect on the disagreement and ask yourself, “How did we get here?” or “Why did this happen?” Without self-reflection, there are missed opportunities to recognize the problem and try to fix it. Try taking a step back from the conflict and ask yourself, “Why am I feeling pain?” or “Why am I using blame?” and both you and your partner may begin to have a productive conversation. When you put the blame on someone else, there is no sense of accountability. Rather than blaming your significant other for the entire source of conflict, it is important you take responsibility for your part in the disagreement as well. After you have reflected on why you are upset and are putting blame on your partner, try finding your fault within the conflict. You may say “I’m sorry” for getting angry, making your partner upset, or even for putting the blame on them in the first place. Conflict takes two, so finding your fault should be possible every time. One very common tool to use for blame is called an “I” statement. Use statements that begin with “I” rather than “You” and acknowledge what you did wrong. For example, you might say “I am sorry I got mad at you. I had a stressful day at work today and I shouldn’t have taken it out on you” rather than “You said you would meet me for lunch at 1 pm and did not text me you would be late.” Using “I statements” help you to refrain from blaming your partner and help you take responsibility without looking for excuses. Sometimes all of these tips may feel easier said than done. If you have tried all the above and still feel you are blaming your significant other out of anger or hurt, you may want to try not reacting at all. If your partner upsets you, practice not reacting, but rather, reflecting on the situation and your feelings instead. Taking the emotional reaction out of the equation helps aid in self-reflection and forces you to take a break when necessary. Practice not responding, and once you have mastered that, try putting the other techniques to use as well. These tactics will hopefully help you and your partner learn to communicate more effectively over time. 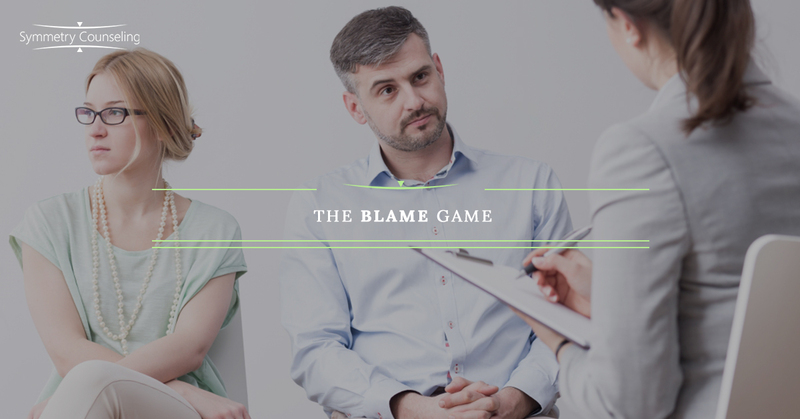 If you can identify a significant amount of blame in your relationship, try some of these tips to help battle the blame game. If you feel like you need some more guidance, it may be helpful to connect with a therapist. Contact Symmetry Counseling at 312-578-9990 to schedule an appointment with one of our very skilled therapists today!